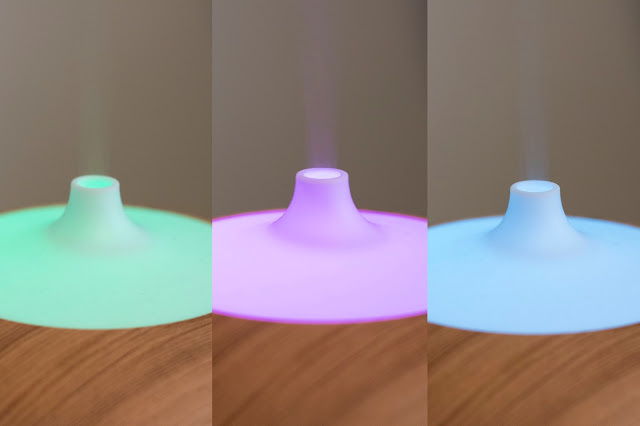 I've been looking for an aroma diffuser that works without heat, and isn't too expensive for quite some time. I've researched essential oils and how to use them a lot, and a diffuser seemed like a great way for me. I want to use it mostly to relax and unwind, so having the entire room filled with a calming scent is amazing! I wanted a supersonic diffuser because this way, the essential oils you use don't lose any of their quality. I bought the O'dor Aroma Diffuser and here is my review! As you can see, the 'steam' is visible, but it's cold because no heat is used! This way it's not only better for the quality of the oil, but in my opinion, it's also much safer! You can see the condensation drops on the top of the diffuser, the small hole creates the electronic frequencies that make the vibrations needed to diffuse the water and oil. You only have one bassin, where both the oil and water go into. If you fill the entire tank, it can diffuse for 6 hours! The scent immediately spreads through the entire room without being too overpowering. It only takes a few drops and a little bit of water. The buttons are extremely easy to use. Filling the tank is super easy, you just take off the top, use the little measuring cup to fill it, add a few drops of your favorite essential oil and close it again. Then you pick how long it should diffuse and if you want you can turn on a mood light in different colours. If the time has past, it turns itself off again. You should always remove any leftover water though! I love using this diffuser when I'm at home and in my room, putting the laundry away, reading or especially when I'm working on a blogpost, because I can get very concentrated and the scents help me relax and enjoy it a little more without stressing out! I'm also curious to try it to help me unwind before bed, but I haven't gotten around to that yet! Right now, I'm trying out a bunch of different oils and brands, expect some reviews soon! This particular diffuser cost me 50 euros, which is quite expensive to me, but I wanted a beautiful design that seemed sturdy as well, so I wouldn't accidentally tip it over! I've created a little aroma spot on top of my wicker baskets in my room, next to my reading chair! It immediately makes my room more cosy. I hope you enjoyed this kind of review! Have you ever used aromatherapie?